LaurieL Photography has mentored photographers who have come from all over the world! The fact that we can offer our clients accommodations here at the studio in a private room, with a private bath, provide all meals, as well as transportation to and from the airport, allows our clients the ability to eliminate the additional costs of hotels, meals and a rental car. Here's what just a few photographers have to say about Mentoring and Workshops with LaurieL Photography! We travelled via planes, trains & automobiles over 4500 miles for nearly 22 hours from Ireland to train with LaurieL and like they say in the TV advertisement :) ..."because she's worth it!" LaurieL's Mentoring was more than worth it. Our training was second to none. I have been to seminars & training days in London with some top international photographers but their training is like kindergarten compared to LaurieL's. Her practical hands-on approach to training leaves other courses & trainers in the shade. Our 3 days covering Newborn, Maternity & Babies under 1 year has set us up perfectly to launch into the world of studio photography specializing in these area's. LaurieL is a one-stop shop for us. Guys/Gals, for anyone considering some training in any of these area's, it's a no-brainer, look no further than LaurieL, you won't regret it. It will be the best investment you will ever make in training. Learn to do by doing! Go to someone who allows you to do it yourself...with your own hands! Watching is not enough. You must feel, touch, hold, use your own mind and senses when posing. Her repertoire of posing idea's, client interaction, lighting techniques, background scenes & props & photoshop tips & actions provides you with a fast-pass to real business opportunities as a photographer that otherwise would take years to learn. The most obvious benefit is the hands-on posing that you will do yourself of the subjects following a demonstration from LaurieL. This in itself is priceless in our industry. Outside of all the training, there is also her excellent Prop-shop with hats, wraps, slings, posing guides, photoshop actions, flowy wraps, belly jewelry, Actions, etc. for maternity and newborn shooting. On a personal note, for those who are fortunate enough to meet her wonderful family, you could not meet a nicer bunch of we people in your life. We were made to feel very welcome throughout our stay in their lovely home & for that we are entirely grateful. Wow! Where do I begin? I just returned from LaurieL's 4-Day 1:2 Mentoring Workshop that I did with my friend Sue. It short, it was an amazing whirlwind of invaluable information and experience! 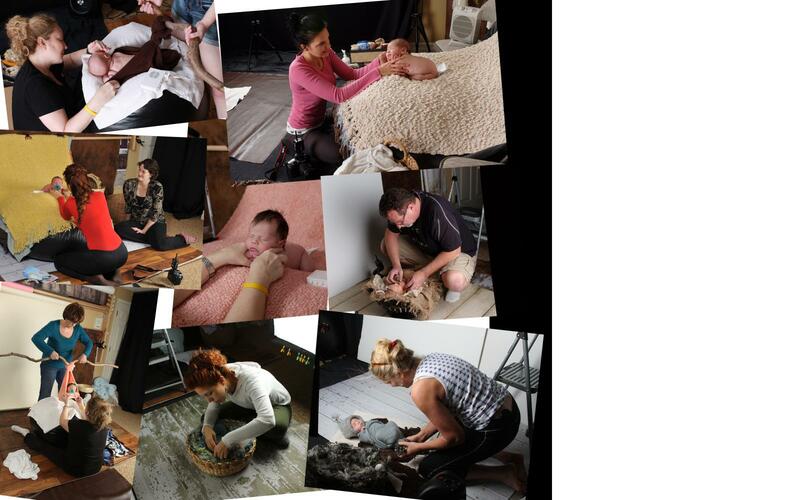 Most of the workshops that I researched were done in groups with demonstration and observation rather than actual hands on posing, soothing and loving on these precious little newborns. The hands-on experience with Laurie, who is truly a master, was absolutely essential. There is soooo much to getting these endearing and magical images that parents can't resist. After 9-10 hours of hands on with 3 adorable newborns my confidence level raised considerably. The second day was all maternity. Laurie's guidance in working with maternity models, posing and studio lighting was empowering. She is truly an open book with her wealth of expertise. The post-production day was also very worthwhile. Though I'm comfortable with my own Photoshop post-production, learning Laurie's shortcuts and specialized techniques was of great value. The last day was business and again Laurie was an open book regarding everything pertaining to running her newborn and maternity business … from the company "Bible" to forms, to custom packaging, her labs, website, Blog, Facebook and more. In short, Laurie is a fabulous mentor. She is a master of newborn and maternity photography and truly wants to help her students succeed and produce beautiful quality work. She is warm and funny… kind and generous. It was truly a privilege, not only to learn from Laurie, but also to spend time with her and get to know the lovely and strong person that she is. I traveled from Israel just to spend 5 days with LaurieL Photography and to get Mentored by her! Thank you LaurieL for a very professional workshop! It was the most useful course of all the photography courses I have ever done and so worth the trip to America! I learned so much 'hands-on' with LaurieL. Group classes are not good for me...I needed 1:1, and I needed an excellent teacher. LaurieL was the best decision I could have ever made!! It is a LOT of money to travel to America...no less the cost of training. But I knew LaurieL would be worth it...and she did not let me down! I just can't tell you how much I learned with her, because she had me do EVERYTHING. She taught me how to pose perfectly, with my OWN hands...as well as the safety measures that need to be in place. I can't wait to get back to Israel and start implementing everything I have learned. I came to LaurieL Photography for 1:1 mentoring...and I couldn't be happier! My time spent with LaurieL was chock FULL of information and HANDS-ON training. I was so impressed by LaurieL's candid feedback and intense training. She was an open book to every question I had...and sat right next to me...showing and instructing me on a pose, and then having me do it until I had it mastered. There was no down time...every minute was filled with learning. It was the best money I ever spent. I could have taken months to learn what LaurieL taught me in a couple days...or could have gone to Group Workshops...and not gotten anywhere near the hands-on experience I got with LaurieL. I highly, highly recommend her to anyone who really wants to learn how to work with, pose, calm, and just be an all around great newborn photographer! I cannot believe how happy I am that I invested the time and money to come to LaurieL for my Mentoring. I stayed with LaurieL for a week, and took 6 days of 1:1 intensive training...where I learned everything I needed to know to start, run, and have a successful Maternity and Newborn Photography studio! Her hands-on approach is absolutely the best thing I could have done, and exactly what I needed. Having 100% of her attention and direction for 6 full days was such an incredible experience...that I am so grateful for. Staying in her home, I didn't need to grab a taxi from the airport...or rent a car, or pay for a hotel. Everything was included...and it was beyond anything I could have imagined. I have gone to workshops before, but have never, ever experienced the dedication to MY success like I did with LaurieL. I cannot recommend her enough. Spend the time, invest in your dreams. It's worth every penny. Thank you so much for all your good work and teaching me so much in one day. I had an amazing time learning from you. You are a Wonderful person and it's such a pleasure learning from someone like you. You are very generous and even if my English still need to improve, I understood everything you said because you took the time to explain well and repeat when I needed. It was such a pleasure to see how you work. I am amazed at how patient you are with moms, babies and students. I never imagined how much work and time it takes to create those beautiful images. I did not realize how much of your time it takes to teach someone. I was debating to come and learn from you or another photographer that does the same thing in Arizona, and I hesitated because of the extra cost of the plane ticket ... but I must tell you I am soooooooooo happy I choose you and I think the amount you asked + the plane ticket are totally worth it with the Incredible work you do! I am so pleased I have met you, and I felt it was the greatest experience I ever had regarding my photography experience. I am 100% satisfied with the time I spent with you yesterday. I do not see how you could improve your work, you are the Best, I absolutely loved my mentoring session! Thank you so much. I recently attended the LaurieL Photography Mentoring workshop for both The Maternity and Newborn Sessions with Laurie. I can't say how incredible the sessions were. Laurie was able to meet me where I was at with my photography skills and took me to a whole new level. It was so fun; I miss being there with her. She shares so much in such an awesome way. I doubt if you can get this kind of mentoring anywhere else. It was amazing. I can't recommend it enough!! The 1 on 1 personal mentoring is so valuable. It included so many specifics about how to get those awesome portraits. She showed me how and then had me doing it all. I was able to take home new skills and feel confident to implementing them right away. She even used some of my images to showcase her sling on her e-store, and the slings are amazing!! Check out her e-store. Everything that she promised was delivered and more. From the pick up and drop of at the airport, to the private suite accommodations, the mentoring, to the awesome food and family. I felt so welcomed. Everything was so valuable and I could see where to apply it. Laurie has a way about her that is so encouraging. Being there with her in her studio one on one is invaluable. I want to do it again. She is very talented photographer and gifted mentor. She is also an incredible woman. I encourage anyone who wants to take his or her Newborn or Maternity photography to a whole new level to attend and spend some time with Laurie. You won't be disappointed. The sessions are geared to what you need and want to know. Laurie really personalizes the sessions to your needs. She shares very practical photography techniques that have made her one of the best newborn and Maternity Photographers in the Northwest. Attending these sessions you will be prepared to take your photography to the next level with the skills, confidence and know how. Laurie has been available since I have returned home for questions and advise. I feel very fortunate to have met her and for being able to attend her mentoring sessions. I can't thank Laurie enough for the time she spent with me. I can't wait to share with her what I've done. I'm more than happy to tell you that my experience with Laurie and her Laurie L Photography Mentoring GREATLY exceeded my expectations!!! I was beyond thrilled with everything that I learned. Everything that Laurie teaches in her Mentoring program is seriously worth about 10X MORE than the price she charges!!! After her course (I did 3 days) you will have EVERYTHING you need to start your own Photography business the very next day! Regarding staying in her home, honestly, I am the kind of person that rarely ever accepts invitations to stay the night, or long-weekends at a friend's house, much less with a stranger that I've never met; so I really do understand anyone with any hesitation! But I assure you that Laurie and her family are absolutely wonderful!!! Her home is beautiful and she has an extremely comfortable guest room (with a private full bath) all set-up on the basement level just down the hall from her photography studio and post-production/editing room. I assure you that I was never uncomfortable about staying in her home, not even for a second; in fact, I was grateful to be right there not having to drive late at night in an unfamiliar area. (And that bed is probably THE most comfortable bed I've ever slept in anywhere!) I had honestly considered getting a hotel room and a car and I'm sooo glad that I decided to stay at her home because we were able to cover so much more material with my being right there. There were nights we worked past 11pm so it was great just being right there, steps away from my bed. Her house really is set-up perfectly to accommodate people. That's pretty much all I can think of! If you are looking for THE best in Maternity/Newborn Photography, Laurie L is the best investment you could possibly make!!! There's NO one else who will devote so much time, energy and patience or give you a true "one-on-one" mentoring than Laurie at Laurie L. Period! My sessions with Laurie were definitely worth my time and investment. Laurie was amazingly informative and I really felt like she was interested in me truly learning. It was a great opportunity to see her in action, and then to be able to do everything 'hands on' as that is how I learn best. She really took the time to answer any and all questions I had. My time with Laurie helped solidified the things I already knew, and put me on a path to greater success as a result of some of the new things I learned from her. Although there were many great aspects, I would say probably the best aspect for me was just sitting down with Laurie and asking a million and one questions. And she spent a large chunk of time just answering my questions. I really felt like Laurie was attentive and genuinely wanted to help me learn and grow. Being able to do the sessions side by side with Laurie was great as well. If I wanted to practice something a little more, she was open to whatever I felt like I wanted to learn or get more comfortable with. She even told me a few times, "I want you to learn what YOU want and need to learn". So I felt empowered to say I wanted to move on if I was comfortable with something and ready to move on, or to say I wanted to practice more if I needed to. Also, she has been amazing after the session. We have communicated several times since my session with her and she has been quick to help or answer questions, or whatever the case was. This has really meant a lot to me. It really made me feel like she truly cared about me as a person, as a photographer, and as a business owner. I really feel like I have a friend in Laurie, not just a teacher or mentor. I would say that my time with Laurie was a turning point in my business, as she really helped instill in me a confidence and validation that I was on the right track. And she has continued to cheer me on! There is no question in my mind that she genuinely wants to see me succeed as a photographer. In such a difficult industry, we could all use our own personal cheerleader! I did not choose to stay with Laurie, rather in a hotel, and I think that was the best choice for me personally. Her studio is in the downstairs level of her home and that is also where the spare bedroom is where you would stay. The hotel I stayed in was only about 5 minutes from her house/studio so it was nice for me to get away and quietly decompress after the first day, but I was still close by so it was an easy drive. A few other things I would add about Laurie: Laurie is a real, honest, genuine person. You can tell she really cares deeply and lives passionately. You don't have to wonder what she is thinking. She pretty much says it like it is, and like she thinks it. Laurie is very confident in her experience and her work and is truly passionate about what she does and who she is and also about her family and those who mean the most to her. I would certainly recommend a mentoring session with Laurie. My best advice would be to sit down before hand and write out every question you think you need an answer for. Write down everything you know you want to learn, and make sure you let her know. Don't be afraid to let her know what you need or want to learn! I had been wanting to do some intensive 1:1 training in Maternity and Newborn Photography for a long time. I scoured the web for almost a year, before I decided on the one photographer that I knew would give me the best training, in the way I needed it. I'm not a 'group' type of person. I was in the very beginning stages of learning photography. I would have felt like a fool in a group of people that all had experience. I needed to learn EVERYTHING...right down to what a Shutter, f/stop and ISO were, and how to use them. After talking with LaurieL, I knew she was the one I wanted to work with. She would take me from any level, and assure that I left ready to hit the road with my new knowledge. And boy was I right!! I took 6 days with LaurieL. We did Natural Light, Newborns, Maternity, Post Production and Photoshop, Running the Business...whatever I wanted to learn...she taught me. I was so happy that I chose LaurieL. I can't imagine getting that kind of intense direction, with so much patience and all out knowledge that LaurieL gave to me. I stayed in her home, and have to say, that the hospitality was amazing. She has a beautiful family and every one of them were loving and kind. My acomodations were perfect...with my own private room and bath. Right down the hall is the studio and her office. We were able to work as long as we wanted. We started and finished when "I" wanted to. If I were to encourage anyone to take a 1:1 class, it would be with LaurieL. You won't get this type of treatment anywhere! I didn't need to rent a car, or a hotel room, or even find a place to eat. Everything was included! NOBODY does that! If anyone wants to call or email me to talk to me about my experience with LaurieL...simply email her and ask for my information. I'd be happy to share my wonderful experience with you!! It was, simply put, the best out there! Full of Joy and knowledge!! Corie Durham! I attended a 3-day newborn/maternity/post-processing session with Laurie and it was fantastic! I really enjoyed the newborn session and being able to pose the babies by myself, as opposed to having someone else pose them and me just taking pictures. Posing newborns is a lot harder than it looks! You won't get anyone else letting YOU do the posing on your own, so that alone makes the mentoring session worthwhile. Word of warning – if you go to the newborn session, bring plenty of changes of clothes!! Those newborns like to pee a LOT the minute their diapers come off. The maternity mentoring session was great as well! It was fun learning how to make the flowy fabric flow and how to make a pregnant woman feel comfortable. Laurie's post-processing skills are amazing! I learned how to do things in Photoshop that I never knew were possible. I was questioning whether or not I wanted to include this day in my mentoring session, but I am SO glad I did! I thought I had fairly good Photoshop skills before the session, but realize that I had so much to learn! Laurie's mentoring program is incredible! I did a 3-day program – newborn, maternity and post-processing, and have to say that I am extremely satisfied. I've done many workshops and would definitely say that Laurie's is number ONE!!! I loved being able to pose the newborns on my own (a task that is much more difficult than it looks), learning a TON about Photoshop and post processing, learning about studio lighting and maternity photography. Laurie's post-processing skills are unbelievable! She taught me how to do things in Photoshop that I never thought were possible. I thought my Photoshop skills were decent before attending the mentoring, but realized that I had so much to learn! I would highly recommend Laurie's mentoring to anyone! Ask her any question and she will answer it and make sure you leave with enough knowledge to put a serious jump-start in your photography career!! Laurie's mentoring workshop far exceeded my expectations!!! I took the four-day 1:2 workshop with my photographer friend, doing maternity shooting, newborn shooting, post-processing and business mentoring. Every day was packed full of hands-on experience whether posing and shooting the models or learning Laurie's post processing secrets. Laurie is a master at all she does, and she openly shares her knowledge and wants you to succeed. She gives more than is expected. She encourages you to get in there and start handling the babies and pregnant women right away. This is not a sit back and watch type of workshop. The days were long, and I was tired by the end of the day, but I wouldn't have wanted it any other way. There was so much to learn and no better person than Laurie to teach it. I had my first newborn shoot just four days after returning home from Laurie's workshop, and I never would have had the confidence to jump into newborn photography without Laurie's training and help. Even though Laurie is naturally a "baby whisperer", she shares all of her secrets with those she teaches. The confidence I gained in handling the babies at the workshop was invaluable. You will not be disappointed if you mentor with Laurie. I can't imagine there is a better workshop out there for learning to shoot maternity and newborns. I can't thank Laurie enough for going the extra mile everyday of my workshop. She is the best! My stay with Laurie was beyond amazing. During her one on one mentoring she showed me the how-to, then had me doing what she showed me. I have taken classes before where you watch how things are done then get home and think, how did they do that again? My session with Laurie means so much to me. She is exceptional, I think I loved her and her work before I met her, but now I know I do. Laurie's strength, spirit and knowledge "Gifted me" with the tools to go out with confidence in all areas, posing, people skills, studio set up and photo processing. Her brutal honesty is what I needed to snap me out of my "Insecurities behind the camera". Being welcomed into her home and treated like family was the icing on the cake. My second evening with Laurie I saw her daughter in the hall outside Laurie's studio at 11:30pm, on the floor, "Doing her thing" but remaining connected to her mother as she went about her late night post processing, very touching. I would recommend Laurie to anyone and everyone. It doesn't matter what level you are at, you will walk away with confidence, creative ideas, and technical capabilities …the list is endless.